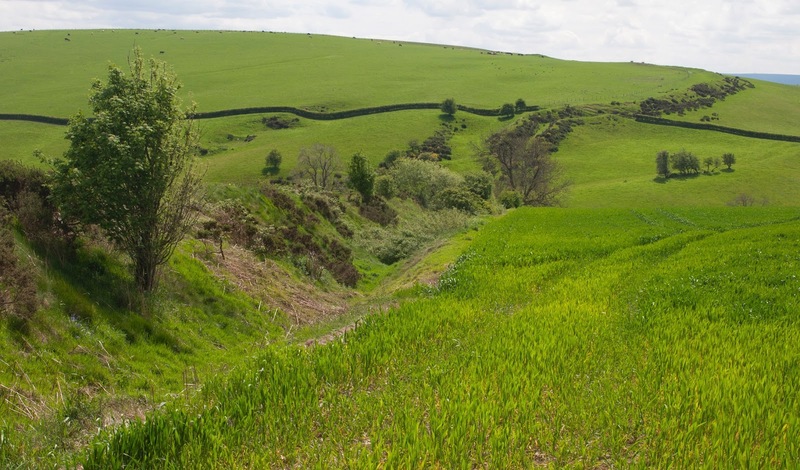 The conservation of Offa’s Dyke has been the focus of two events in recent weeks. Both were hosted by the Offa’s Dyke Association (ODA) and took place at the delightful Offa’s Dyke Centre in Knighton. The first event, on 23 March, was the third meeting of the Offa’s Dyke Collaboratory; the second, on 12 April, was a formal consultation on a new Conservation Management Plan (CMP). The Offa’s Dyke Centre in Knighton, home of the Offa’s Dyke Association. Rather than providing a ‘blow-by-blow’ account of the events, this post summarises some of the main issues around the CMP which were articulated at both meetings. First, some background. The Offa’s Dyke Collaboratory was established after discussions in 2015 and 2016 around Keith Ray’s monumental book on the Dyke. A number of us felt that some sort of loose collaboration was needed between people and organisations who had been most actively engaged in research, and were likely to be so in the future. The Collaboratory is a mechanism for engagement between academics, communities and professionals; so far three events have been held and fourth is being planned for later in 2018. 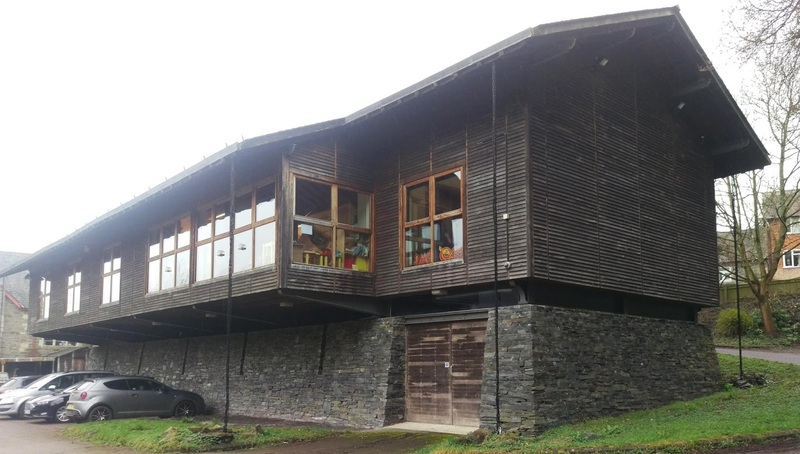 The papers presented at the Collaboratory event in March can be found on the Offa’s Dyke Collaboratory website – along with more information about the Collaboratory, and its events and activities. Meanwhile, in 2017 and 2018, Historic England and Cadw jointly funded the production of a Conservation Management Plan for the Dyke. This work – which was overseen by the ODA and undertaken by Andre Berry – was the first re-appraisal of the conservation issues surrounding the Dyke since the original Conservation Statement was produced in 2000. The new plan has not yet been published, but is in the final stages of production. From what we have seen so far it looks a very thorough piece of work providing a comprehensive and detailed survey of the condition of the Dyke, and an analysis of the key threats to it. The meeting in April was split into two parts – archaeology in the morning, and access (including the relationship between the Dyke and the Offa’s Dyke Path) in the afternoon. Offa’s Dyke at Llanfair Hill, Shropshire. Discussion topics ranged from the minutiae of data management to the possibility of Offa-branded food and tourism products. Three areas stood out for me. What about the data? The CMP has produced an enormous quantity of data. Of course there is already a great deal of information on the Dyke already held by the Historic Environment Records (HERs) of the three English counties through which the Dyke passes (Gloucestershire, Herefordshire and Shropshire), and by the Clwyd-Powys Archaeological Trust (CPAT) in Wales. There was some discussion about how the data gathered by the CMP process is integrated into the HERs. The creation of a separate database would create all sorts of issues around adding new data to it, or accessing the data already in it. It is also not yet completely clear who owns the data and who may use it. It was agreed that more thought could perhaps have been given to this at the outset of the CMP project. Fortunately the four HER Officers are working closely to resolve some of the (minor) technical issues, and there was clear agreement that this will be a priority for the CMP. Indeed further cross-border co-operation in this area would be a positive outcome more generally for the longer term. Informed conservation? The management of the trail needs careful co-ordination with historic environment needs: the CMP has clearly highlighted the need for better co-ordination between the creation of path infrastructure and monument conservation. However it was clear that resources to manage the National Trail were already stretched and likely to be more so in the future. The CMP has also prepared draft archaeological guidance. This is welcome in principle, but the emphasis of the draft proposals sat uncomfortably with many people. Some questioned whether the proposed priorities represented the best use of resources. Many of those present felt that potential opportunities to learn more about the Dyke were not being fully considered. In many places the monument is poorly understood, or even not known at all, and excavation would enable conservation to be fully informed by better understanding. A more ambitious, imaginative and creative approach would be welcome. Whose Dyke is it anyway? The increasing divergence between England and Wales in historic environment legislation and resourcing (for which see my recent paper on politics and heritage in Wales), together with the different approaches in the various local authority areas, means that ‘ownership’ – of research and conservation, and the data that can be derived from projects – is potentially fragmented. Moreover, archaeologists and ‘heritage bureaucrats’ aren’t the only stakeholders. There is a long tradition of non-professional engagement with the Dyke. Sometimes this has been under the umbrella of community-focussed heritage projects by professional bodies such as CPAT and Herefordshire Archaeology. Elsewhere individual groups have developed more independent approaches, such as the recent development of the CoSSM project. The ODA itself has been instrumental in developing a much wider understanding of the Dyke’s historical role, and has also generated a great deal of enthusiasm for the landscape through which it passes. Much of this enthusiasm is driven by aspects that are not directly related to cultural heritage. 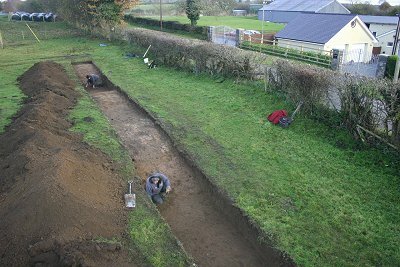 CPAT excavations of the Whitford Dyke (Flintshire) in 2012. Photo copyright CPAT (3551-0033). The CMP is an excellent piece of work, and a sound basis from which to start. Everyone agreed that there must be more archaeological research, better integration of data, improvements to access, and greater community and landowner awareness. However substantial funding for any large-scale project – whether for conservation, access or research – seems unlikely to materialise in the current climate. Replicating the CMP walkover survey at regular intervals would seem to be the most cost-effective way of monitoring the condition of the monument. Conservation needs to be informed by understanding, and – as many said at the meeting – our understanding is somewhat limited (I articulated three areas of particular concern in a previous post). The best approach will be to embed the CMP findings into the HERs so that they can inform more localised research frameworks and investigation projects. These in turn can be delivered under the umbrella of the Offa’s Dyke Collaboratory, to ensure synergy between research, conservation and public benefit. It will be interesting to see to what extent the discussions at both meetings – but particularly the formal consultation – will have on the final form of the CMP. These are some initial thoughts, and they may cohere more gracefully in time for my presentation on the conservation of Offa’s Dyke at the forthcoming CIfA Conference in a couple of weeks.